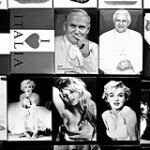 53/365 – “Habemus Papam” nr.25, a photo by Luca Rossini on Flickr. To most of the tourists, Rome isn’t solely the city which hosts the Vatican and the Holy See, but also the capital of what was called the “Dolce Vita”, the dream of a sensual and idillic life-style which is the pivot of the most famous of Fellini’s movies. Plus, everyone in the world knows that no one like Italians like good-looking women (or maybe just no one in the world makes it more obvious…). 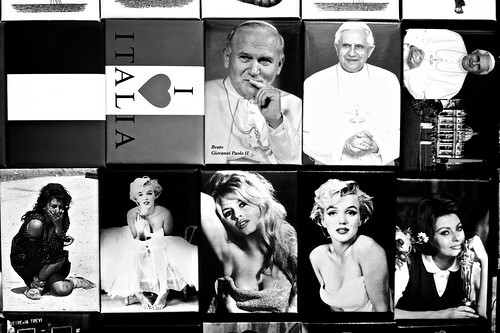 While you won’t obviously find any (almost) undressed girls’ pictures in the shops around the Vatican, you don’t either need to go much further before the profane catches up on the shelves, while the sacred never leaves. Basically, just on the other side of the Tiber river you’ll find the Pope(s) surrounded by Italian (and foreigners, we like all the women!) sensual icons of the old times, plus the unavoidable flags.